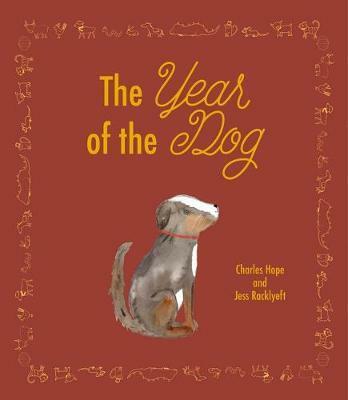 Charles Hope, author of The Year of the Dog, has given us a charming and moving story of hope, friendship, wanting to belong and be loved. Hope has woven the animals and personality traits from the Chinese Zodiac into the story giving it a deeper meaning. Dog lives at The Home for Lost & Unloved Animals. While the name of Dog's home might suggest that the residents of this shelter are lost and unloved, the name signifies the lack of a loving family to live with. These 12 animals do however experience loving friendships and kindness. Each time an animal is chosen by a family to go home with them '...Dog's heart leapt and sang...' she felt love. Readers will become invested in the story hoping that maybe Dog would be chosen next. As each day passes Dog never looses hope in belonging to a loving family. But when Dog's last friend, the Rooster, is chosen she feels sad and alone. Will Dog stay brave while waiting to be chosen by a family? Hope has given readers a story that includes themes that reach into your soul. While the story depicts animals in a shelter it could also ignite conversations about feelings that children may experience if they live in an orphanage or are waiting for a foster family. Illustrator Jess Racklyeft's illustrations are endearing. Lovers of endpapers will delight in the repeated pattern of the 12 animals from the story. She has used soft washes of watercolour that create a gentle mood for a story that is deeply emotional. Racklyeft's illustrations include pop's of red paint, the colour traditionally used by Chinese to symbolise good fortune and luck. When Rooster gifts Dog a red collar it mirrors the tradition of gift giving at Chinese New Year. Though the gift we know that Dog will be lucky and finally be chosen to belong and be loved by a family. In the story the animals are chosen in the order of the Chinese Zodiac. Hope has Dog specially recognise personality traits for each animal that correspond to their zodiac sign. At a deeper level The Year of the Dog can be used to help children identify attributes of their own personality as well as their friends and family. For readers that would like to know what Chinese Zodiac sign they are or more information about the sign's traits please see the end of the book. Also note that due to differences in translations of Chinese to English some animal names may vary depending on your information source. For example, Hope has chosen the sheep as the 11th animal symbol but it is sometimes translated to a goat or even a ram.